I’ve been eyeing Gloomhaven for a long time, but I never played. Of course, I had read the rave reviews of the game and was well aware that, despite a hefty price tag, it sold out pretty much immediately upon release. (Thankfully, it’s in print again.) It’s the most highly rated game of all time on Board Game Geek. But I finally played it. Mrs. Crit For Brains proposed a game night, and a few friends agreed. Soon, one of them offered up Gloomhaven. None of the rest of us had ever played, so we were excited. 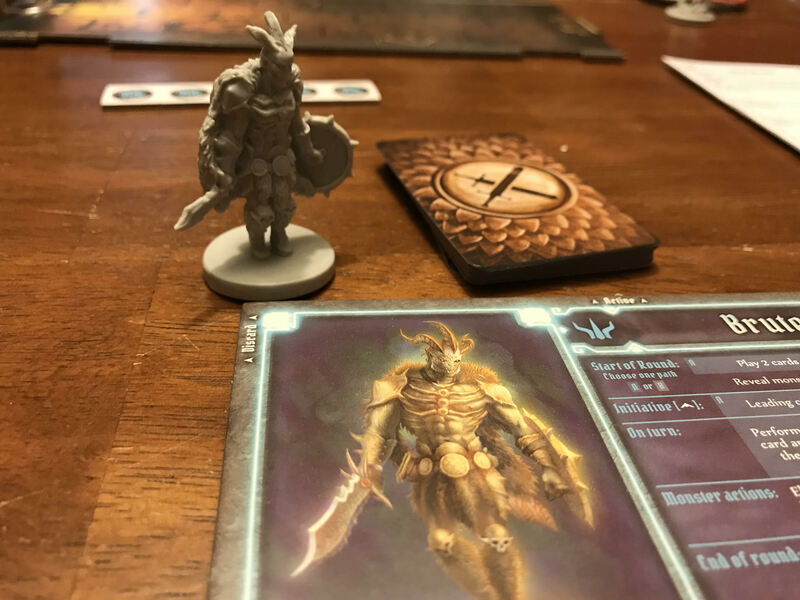 If you don’t know, Gloomhaven is a tactical miniatures combat game set in a persistent world. That means there’s not just scenarios like a lot of mini combat games, there’s a world to explore and quests to undertake. And it’s a legacy game, meaning the campaign is ongoing and you open and use (and permanently mark up) elements of the game as you play it. If you buy Gloomhaven via Amazon, Crit For Brains gets a small commission at no extra cost to you. It helps keep this site alive. It’s closer to a full D&D campaign than something you just bust out for a little fun. 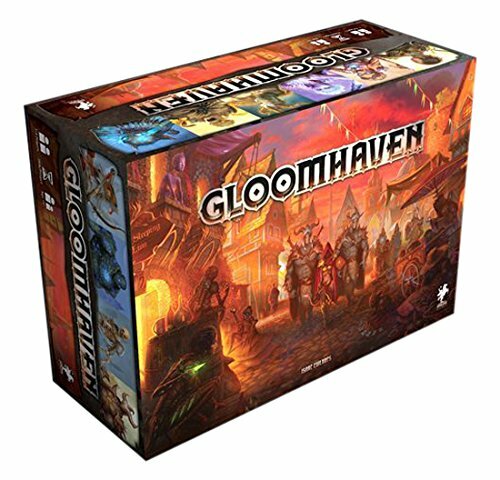 Unlike other legacy games (most have 15-25 scenarios to play through), Gloomhaven has more than 75. They all take an hour or more. And like a D&D campaign, it’ll take you at least a year to finish it. So that’s where we landed last weekend. I knew of the game. I knew it was minis combat. I knew all those things. Each character class has its own box with its character card, reusable sheet, power/spell cards and such. Then it has another box containing its miniature. We started with the first scenario: Black Barrow. In short, our four characters — Brute, Tinkerer, Spellweaver, Mindthief — busted in and started beating up the bandits within. I played the Brute, so I ran in to destroy things and soak up damage while the squishier guys in back fired off ranged attacks, threw spells and summoned rat swarms. We worked our way through the three rooms of the barrow, blasting bandits and archers while evading traps and picking up coins. 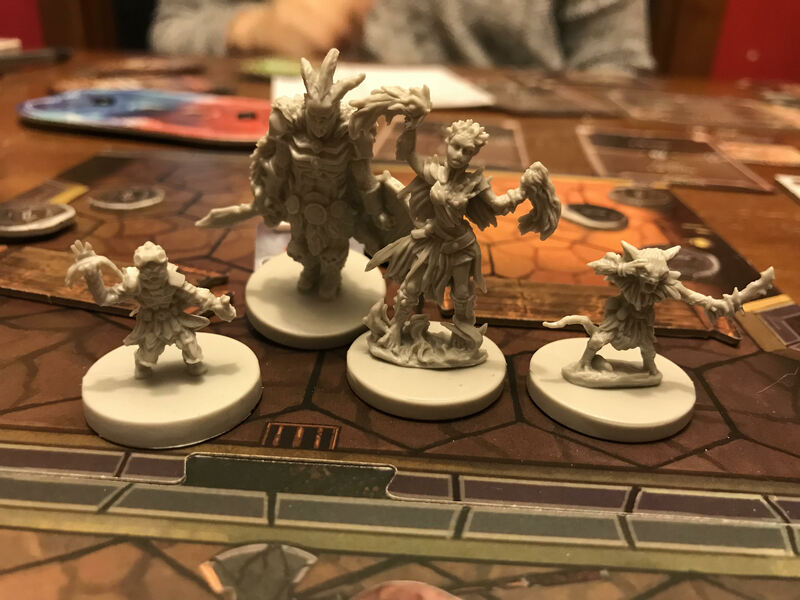 We had a lot of fun, and by the end even Mrs. Crit For Brains (who is not a huge fan of minis combat) said she loved it. I’m excited to play more, and I might just pick up my own copy. 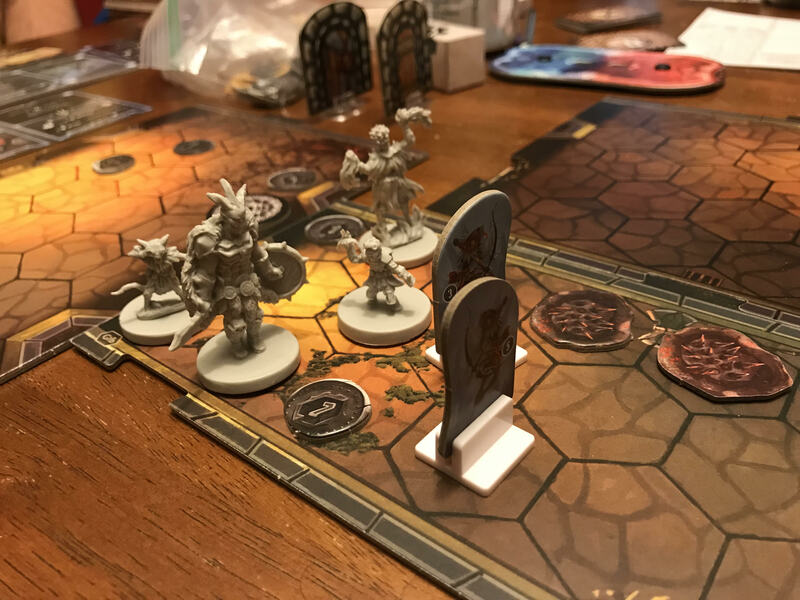 I have to say, I love the mechanics of Gloomhaven. For starters, there are no dice. Yeah, you read that right. The game is entirely card-based. No rolling to hit. No rolling for damage. Just card drawing. That makes it sound simple, but the game is admittedly complicated. The way the cards work. The way you discard some and “lose” some into a permanent discard pile. The way you recover cards. Everything you do as a player is based on the cards you choose before the game starts. Each class gets a set of cards, and they all have unique mechanics. Each turn, you must choose two cards from your hand to play. Each card has an initiative number. Each card also has a basic attack and move option. 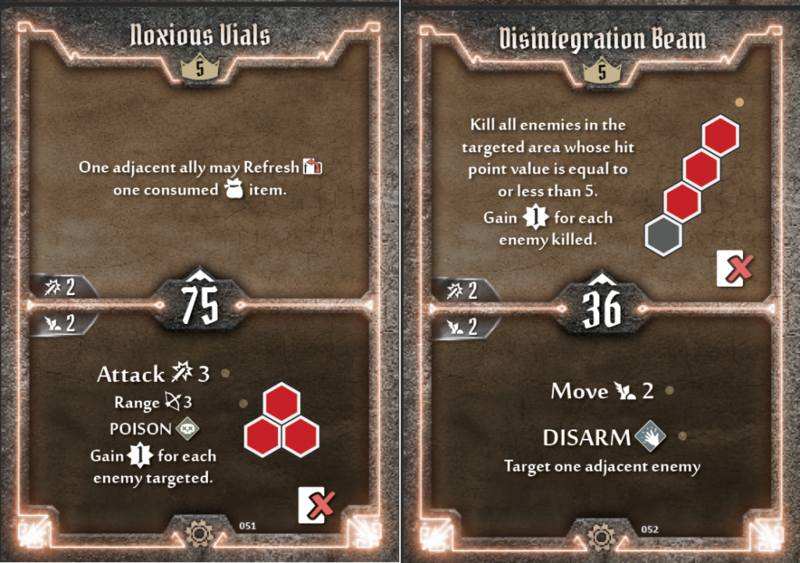 Then each card has two more unique options including attacks, moves, spells or abilities. So each turn, you play two cards and pick two abilities, giving you a ton of unique combinations on how to play your turn. Some cards get discarded. Some get “lost.” When you run out of cards in your hand, you must take a short rest (lose a random card, but you can keep moving) or a long rest (get HP, choose a card to lose, but miss a whole turn) to get your cards back. Taking more damage than you have available, and you lose another card. The mechanics offer a ton of options and combinations, making your moves very strategic. And the scarcity of cards (you will slowly but surely lose cards to the permanent “lost” discard pile) makes every single turn count. You’re forced to make tough decisions. You basically have a time limit, and you have to decide whether it’s important to pick up coins (you can spend them in town between scenarios to get unique items and healing potions) or kill enemies or (sometimes) just rush through the building to get to the other side. If you take too much time, you absolutely will become exhausted. Mission over. But part of the fun is figuring out how to get your character to survive and accomplish the mission. Since there’s no dice, you’d also think it’s not as random. Every attack hits. But a little randomization comes via a second set of cards, which give you a boost to your attacks (+1 or +2 all the way up to doubling damage, kind of like a critical hit) or a negative effect on your attacks (-1, -2 and all the way down to a total miss). And that’s where leveling up comes in. As you use certain powers, you gain experience. When you level up, you get perks that remove -1 cards from the deck or other power-ups. Gloomhaven takes place in a large world. And the world map is not defined. You won’t discover what’s out there until your group ventures out. Other than the actual city of Gloomhaven, the map is blank except for numbers. When you discover a new place, you put a sticker on the number. So what’s up with those islands? You won’t find out til you venture there. And that’s how the whole game goes. Early on, you only have access to some characters. You won’t unlock them (they are literally sealed in their character boxes) until you find them in the campaign. It is a bit of a bummer that only the heroes have plastic miniatures — the enemies are all cardboard pawns — but considering how much is in this game, it would have shot its $140 pricetag through the roof to have more plastic in the box. So if you’ve made it this far into the review, good for you. It’s the same with Gloomhaven. It’s a complicated game, as I said before. But when you get through it, you’ll find a real piece of gaming excellence.